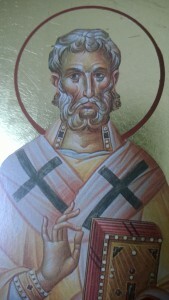 St Polycarp, picture of true Catholic manliness, pray for us! I love St Polycarp. This courageous Bishop of Smyrna (present day Izmir, Turkey) led his flock with grace and integrity. He taught them to hold fast to the Faith, particularly to the Eucharist. This disciple of John led by example, even unto his martyrdom. I encourage you to read his letters. They are a major reason I am Catholic today. St Polycarp showed me the first century Church that we see blossoming in the book of Acts. He made me question my presuppositions regarding authority, worship, and sacraments. His greatest lesson to me, however, is his resilience. Polycarp, at age 86, would not give in to the smallest concession to the false gods of the Roman Empjre. No, he stood strong, facing their threats with gusto, and even a little “ain’t skeert” swagger. Read the accounts of his martyrdom. St Polycarp, you are the man. Thank you for opening my eyes to see the Church you love so much and our heavenly feast in the Eucharist. Pray for us. Posted on February 23, 2015, in Catholic Belief, Catholic Convert, Catholic Manliness, Personal Witness, Saints and tagged eucharist, izmir, martyr, polycarp, smyrna. Bookmark the permalink. 4 Comments. That last one is pretty powerful, if you think about it. Spot on! So glad you used Polycarp. He is fiercely faithful, as we should be. You have reminded me of something else. We want to have you on the show one week. Look at your calendar and we can talk offline.